Now we look at ways to modify the contents of contacts stored in the address book. We now have an address book that not only holds contacts in an organized manner, but also allows navigation. It would be convenient to include edit and remove functions so that a contact's details can be changed when needed. However, this requires a little improvement, in the form of enums. We defined two modes: AddingMode and NavigationMode, but they were not defined as enum values. Instead, we enabled and disabled the corresponding buttons manually, resulting in multiple lines of repeated code. We also add two new slots, editContact() and removeContact(), to our current list of public slots. In order to switch between modes, we introduce the updateInterface() function to control the enabling and disabling of all QPushButton objects. We also add two new push buttons, editButton and removeButton, for the edit and remove functions mentioned earlier. Lastly, we declare currentMode to keep track of the enum's current mode. 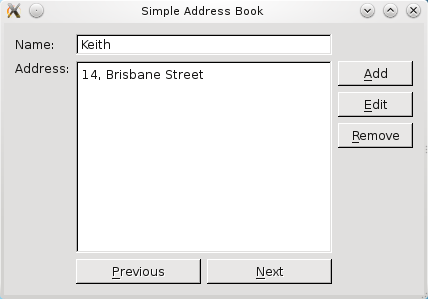 We now implement the mode-changing features of the address book. The editButton and removeButton are instantiated and disabled by default. The address book starts with zero contacts in memory. These buttons are then connected to their respective slots, editContact() and removeContact(), and we add them to buttonLayout1. The editContact() function stores the contact's old details in oldName and oldAddress, before switching the mode to EditingMode. In this mode, the submitButton and cancelButton are both enabled, hence, the user can change the contact's details and click either button. The submitContact() function has been divided in two with an if-else statement. We check currentMode to see if it's in AddingMode. If it is, we proceed with our adding process. Otherwise, we check to see if currentMode is in EditingMode. If it is, we compare oldName with name. If the name has changed, we remove the old contact from contacts and insert the newly updated contact. If only the address has changed (i.e., oldAddress is not the same as address), we update the contact's address. Lastly, we set currentMode to NavigationMode. This is an important step as it re-enables all the disabled push buttons. To remove a contact from the address book, we implement the removeContact() function. This function checks to see if the contact exists in contacts. We mentioned the updateInterface() function earlier as a means to enable and disable the push buttons depending on the current mode. The function updates the current mode according to the mode argument passed to it, assigning it to currentMode before checking its value. For NavigationMode, however, we include conditions within the parameters of the QPushButton::setEnabled() function. This is to ensure that editButton and removeButton are enabled when there is at least one contact in the address book; nextButton and previousButton are only enabled when there is more than one contact in the address book. By setting the mode and updating the user interface in the same function, we avoid the possibility of the user interface getting out of sync with the internal state of the application.